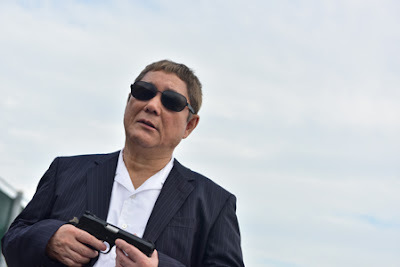 Takeshi Kitano is back as Otomo the one man wrecking crew in the latest in the Outrage series, Outrage Coda, which is a good but not great entry in the series. The plot of the film has tension happening between Korean and Japanese crime families. It seems that five years after the last film Kitano has quietly gone off to live in Korea. He spends his time fishing and watching over a small criminal kingdom. When a ranking yakuza beats up some of his girls he steps in and demands payment for the damaged goods. Having no idea who Kitano is he agrees to pay for the damage but he then kills the man set to collect. This sets ripples through the crime families as the Japanese families begin to circle each other looking for an angle to get more territory. Meanwhile Kitano decides he is pissed off at the death of friend and he returns to Tokyo to get revenge. Confused and confusing this is the sort of film that doesn’t seem to make a lot of sense. There is enough going on that we remain engaged and interested but there is very little makes sense. Its grand plans involving lots of people and it’s hard to follow. It also doesn’t help that writer/director and nominal star Kitano disappears for large portions of the movie. After the first 15 minutes he’s gone for the better part of the next hour, showing up again simply to stir the pot and kill lots of people. He and his buddy neatly wipe out a whole room of gangster in seconds at one point. More talk than action this is a film where the violence explodes in splashes of orange looking blood before disappearing. It all feels like this was thrown together for the hell of it. I can see Kitano hanging out, wanting to make a movie but not being able to get funding for a passion project so he threw this together. It feels half thought out. And while I can pick on the film mercilessly I do like it. Great actors get to play bad guys. Its great fun as everyone chews scenery and seems to be having a good time. I say this because it frequently seems like Kitano and his cast seem to be fighting back laughter. Normally that wrecks a film, but somehow here it comes across as charming. I had a great deal of fun watching this film. I liked it so much that I was up for two hours after my bedtime watching it. If you’re a fan of the earlier films in the series or Kitano, give the film a shot since any film with Kitano in it is better than one without him. For tickets and more information on the Japan Cuts screening on July 28 go here.